I've always been a big Janet Evanovich fan and still do enjoy her Stephanie Plum series. I'm excited to see that she is starting a new series and I will be checking this one out too. 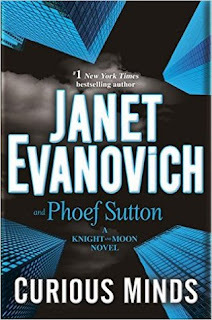 Janet Evanovich, #1 New York Times bestselling author of the Stephanie Plum series, teams up with Emmy-winning writer Phoef Sutton for a brand-new series of thrillers featuring the invincible and incompatible pairing of Knight and Moon. Great pick! I really like the synopsis! I yet have to read a Janet Evanovich book. Its weird cause in the stores here in India, I see so many books by her and very little or never of the authors that I read. This book is on my Wish List! I'm also looking forward to Tangled Up in Brew by Joyce Tremel as well as Christmas Caramel Murder by Joanne Fluke. I'm looking forward to your review of Curious Minds! I haven't read any Janet Evanovich in forever and I don't think I've read any of her collaborations. It sounds like a lot of fun. I've enjoyed the Stephanie Plum series, but I haven't read any of her other stuff. I'm interested in this one. Have a great week!